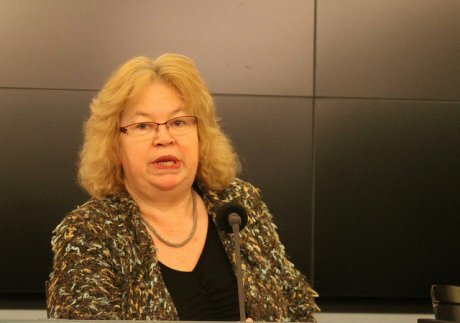 Jean Lambert MEP. Flickr/PICUM Pics. All rights reserved. oD: This Westminster conference was titled "Why bother about the European elections?" We understand MEPs from every political party were invited to answer this question, and only the Greens and UKIP turned up? JL: It’s not the first time we’ve ended up with just the two of us together on a panel. oD: But you do think it’s important to have contesting views on the EU in the same space for people to make up their own minds? JL: If you’re trying to give people an idea about what’s at stake in the European elections then you need different views on that panel. If you really want to talk about democracy and what’s at stake, you can’t just do that with something that looks like what Gerard would call ‘the cozy status quo’. So I think it’s necessary to have as broad a debate as possible. oD: Will young people in Europe play an important part in these elections, especially against a background of the polarization of politics? Might this set the context for drawing the attention of people who may be voting for the first time, to the work of the European Parliament? JL: The task is always to transform that sort of public response into people actually voting. Historically, young people are not the group that is the most likely to go out and vote, and in fact there is a lot of anger amongst them and people generally who feel that Europe is part of the problem. If you’re not careful people say, “well, stuff the lot of you” and “we’re not participating”. I’m an elected politician so I don’t think that a protest boycott is the way to change things. But that’s by way of preface to an answer to your question. In terms of how the European Parliament draws the attention of European voters, this will vary from country to country. There will be an institutional response - a range of publications, TV broadcasts and so forth about how the European Union is trying to respond to such key issues as unemployment. In terms of how the parliamentarians respond, it’s clear that for a number of political parties, questions about youth employment will be a major plank of their political manifestos. That’s already clear, it’s clear for the socialists: it will be for the greens. The European Young Greens are extremely involved in the election campaign this time around in a way which I think they haven’t been before. Some of it will be about money on the table, e.g. the Youth Guarantee (which was originally a Green proposal). But we are very aware that this is just a drop in the ocean compared to the structural change which is necessary. So all this could be too narrowly conceived. The future is not just about unemployment, it’s also about rising sea levels and a whole set of other constraints on people’s futures. The institutional response is, by necessity, limited and it will be particularly limited when it comes to the UK - not least because we have a very Euro-hostile environment. It’s not Euro-skeptic, it’s Euro-hostile. The real question is – “what do we want to do with the European Union in the future”? But also, “where do we think new jobs are coming from?” Here, my own political group has been doing a lot of work on moving to a low carbon economy, which is not going to offer millions of jobs overnight. This is the challenge that all political groups face. The other question which is bound to be on the agenda is whether austerity measures are actually helping people to work or at least to secure the essentials of life or not. There, you will see a big political divide. We Greens are very clear that austerity is not going to provide for people in the next period. oD: So you would agree that there is, at the moment, a big crisis of legitimacy in the European Union? JL: There is a big crisis of legitimacy for the European Union – but it isn’t confined to the European Union. There is actually an overarching crisis about governance. The European Union in itself is still comprised of national governments. By and large, that’s still the driving force, and nothing happens within the EU unless you have the buy-in of national governments. So the question of legitimacy leads us directly to the relationship between the national governments and what they sign up to at the European level and then what they do with this. You could say that one part of the crisis is due to governments not sticking to agreements that they’ve made to look more closely at how their economies were running; just assuming business as usual would continue and that somebody else would pick up the pieces. But there are other issues of legitimacy: what does solidarity mean within the European Union now and what actually is good governance? oD: You haven’t mentioned the EU’s democratic deficit, something that the right offer as one of the main bedrocks of their euroscepticism. Isn’t this one of the reasons why the populist right are winning the debate on the crisis of legitimacy within the European union? JL: They have a simple message: I think this is the problem. The European Union, because of the whole way the balance of powers within it is structured, certainly for a British audience, is difficult to explain. The British are not used to discussing a balance of power or cooperation between political parties, because we have a very confrontational political system where it really is ‘winner takes all’ and when you’ve won the election, you don’t really have to take account of anybody else. Unless you’re David Cameron, of course. But in this knockabout tradition, a balance of powers, let alone cooperation, always sounds weak. Whereas actually it’s not. When it comes to the democratic deficit argument, the more populist voices on the right tend to leave out the fact that national governments are deeply involved. You will very rarely hear them talk about the ways in which the British Government has been involved in every single decision that the European Union has ever made, alongside the German government, the Danish one or whomever. Okay there are varying systems of mandate calling governments to account from country to country, but it’s always framed as if somehow the British are the victims of a cabal at the European level, that our government is dragged along protesting and always overruled…This is part of the framing. It comes down to the fact that what makes news is confrontation, not cooperation. People getting along well together and finding a solution is never going to make a headline. But certainly, there are also issues with the way in which the European Union is structured. There’s more movement on this now than there has been in the past. It is looking at how exactly national parliaments fit into the committee of the regions, or ECOSOC. We haven’t until recently had a structured way of working closely with national parliaments. That is now changing, and I think that’s very positive. oD: Is there a psychological barrier towards Europe and the European Union in the UK, when compared to other European countries, which might explain why Britain wants to break away? JL: There are a couple of strong elements pulling in a different direction. One is obviously the relationship we see ourselves as having with the United States: a tension about who you want to be part of if you are going to be a global player. It’s quite interesting that many people from UKIP or beyond who are more Euro-hostile, actually feel quite happy about having a close relationship with the US, which they perceive as more of a relationship between equals. They think our culture is more similar, our understanding of the economy, of the labour market, than it is with continental Europe. It’s embarrassing to the Conservatives, but it is still there and affects our understanding of history and the commonalities that are made and remade in history. Because the UK wasn’t subject to invasion in the Second World War, there is a difference of experience which also plays in. After the fall of the Soviet Union, the British began to make a few more friends, a British-Polish connection to add to the British-French one, so maybe that is beginning to change. But these shifts in the tectonic plates are slow. oD: Throughout Europe there’s been a huge amount of organization, especially on the left, in response to the financial crisis. This has contributed to the rise of right and left in Greece or in Spain, for example. Greek political debate seems to me to focus around people who represent these larger political tendencies, whereas in Britain you always address people as if they are individual voters. JL: The UK also has a very strong civil society side of things, but not necessarily with strong political labels. But if you take trades union organization in the UK, until fairly recently you’d have said that was politically sewn up. There’s still a lot of trade unionists who certainly view the Greens as natural friends or ‘sympathetic allies’, as it was put to me last week. But there is that different history of the first-past-the-post constituency-based system of representation. This is also an integral part of our political history. If you’re looking at politics as a sort of street action, that’s a different thing. You’ve had a high level of organization, to protest against the poll tax and in anti-war demonstrations: 1 million, 2 million on the streets. But I think British people feel that you don’t necessarily win change that way. That’s part of it. It’s also that we are not yet facing the hugely dramatic levels of youth underemployment in countries where a majority of the MPs have put EU directives into force on austerity - so there’s a difference there as well. In the UK, definitions of success and progress are about home ownership and about work. It is much more individualized than some other European member states. But you need to be careful not to confine your examples to Greece or Spain with the most dramatic unemployment rates. You could also argue, “Why haven’t you had enormous change in Hungary?” If you’re looking at what’s happened with the economy you have to look at all the EU countries with economic bailouts. There have been EU requirements for massive cuts to the public sector, cuts to pensions, cuts to all sorts of things, and you still haven’t seen in some other countries the sort of the response you’ve had in parts of Spain or Greece. You could argue that in Hungary the response has been contained by people finding a place of protest to go to – and that the place they’ve found is Jobbik. oD: Do you think this will lead to some dramatic results in the next European elections? JL: Certainly, the Spanish Socialists are very worried about what the outcome will be for them, and I think that also has real implications for the European Parliament after the next elections. If you are seeing a parliament which is much more polarized, there are real concerns about what, if any, progress you can make. This is not just the threat of an expanding harder left or harder right. But if that happens, it is more difficult to reach the kinds of qualified majority you need to make changes. Coming at it from a Green perspective, the issues that we would want to talk about - economic issues of course but also how we respond to climate change or whatever, if you get a parliament that’s fractured and groups who believe shale gas and nuclear energy are the ways forward - and those groups aren’t all on the right – it’s quite a frightening prospect. On climate policy, you really have to be concerned for the world’s youth. oD: What will the European Greens be aiming for as a campaign? JL: You need a campaign that is responding to very immediate issues about jobs and the economy, but you also have to make sure that we’re keeping climate on the table, despite the fact that it is becoming more and more difficult to make any sort of progress on that whatsoever. That problem is not going away. A lot of energy is going into trying to stop things getting worse, which means that you’re at the negotiating table, whether it’s on the budget on anything else. In the eyes of many of our voters, they wonder, “but what are you doing? Why aren’t you out there?” and part of the answer is “well, politically, we’re trying to do something here at the EU level that will have an effect out there.” So we also have to address where people think politics happens, where changes actually happen. For us members of the European Parliament, how to link what you’re actually doing at the negotiating table with the reality of people’s lives out there is a big challenge. Take, as I said, the ‘Youth Guarantee’. This is 6bn euros coming out of the EU budget—peanuts, front-loaded—but the chances are that it wouldn’t have been there if the Greens hadn’t pushed for it. And this relates to the same argument that we’ve been having with the European Union budget as a whole. If people think that the EU is in charge of everything, which it isn’t, well, then, they are capable of giving us a budget cut and yet asking for far more to happen at the same time. So, I have to ask people - if you are against austerity cuts outside the European Parliament, why on earth are you in favour of them being applied inside it? oD: What contribution do you think the media make to helping the European electorates understand these issues? JL: The reach of the Daily Mail internationally is considerable…and depressing. The best reporting on the European Union is in the Financial Times. They actually do understand the importance of the decisions that are made, whether it’s banking regulation or whatever else. Certainly in the UK, the media have fewer and fewer reporters in Brussels. So the reporters that they do have are expected to cover NATO and almost anything that happens on the continent within striding distance of Brussels. So they have a very big workload. Even the BBC has reduced its coverage. We’re down to Andrew Neil once a month, the Andrew Neil monopoly, instead of the weekly programme about the European Parliament which they only ever put out on the parliament channel and BBC world services. It never got anywhere near BBC Two in the UK. So they too have been restricting the EU to headline issues, and a lot of the coverage is very nationalistic. They will talk to British MPs and ministers much more often than they’ll talk to MEPs. It’s changing a little in some pockets. For example, Sharon Bowles of the British Lib Dems chairs the Economics Committee which has a big role in the banking crisis so, hallelujah! At long last they’re talking to a British MEP. They complain that it’s difficult to cover the European Union because it’s not clear at what point a decision is made. There is some truth to that: the votes in the parliament are not always the deciding vote. But increasingly they are, because we have co-decision. Much of what we’re discussing is about two or three years ahead of where it hits you. Even so, there is also quite a heavy prejudice as well in the British media that nothing good ever comes out of the European Union. You’ll find former BBC journalists who will say that in the time they worked at the BBC they weren’t ever really allowed to run a totally positive story. I know people who worked for British broadsheets in Brussels who’d say 'we filed a balanced story', but by the time it made it into print a negative slant had been worked up by their editors. So where would you go if you wanted to find something more balanced? And most people don’t - a lot of people only read the headline. I do a lot of work on asylum and immigration and if you walk past the newsstand and see only the headline, but never have to read the story, there is a drip-drip-drip-drip-drip effect the whole time that must influence your point of view. It’s the same on the EU. JL: Anything that looks stupid! Here we are with people out of work, the economy crashing and what are they talking about - olive oil? It’s also about choosing their stories to help maintain a view that this is an expensive irrelevance. Those same papers will not splash headlines about what just got cheaper thanks to the EU. You may find it, but you’ll have to go a long way to do so. oD: How can we tackle inaccurate reporting in the media? JL: You can be sucked into these minor details, you can become so concerned with wanting to set the record straight. The European Commission has whole websites for countering disinformation and misinformation about Europe, websites that say, “this is the story that you read, this is the story as it is.” If I was interested in the European Parliament having a real impact in schools, I might target media studies: “here’s the story, dear teachers of media studies, let’s look at how we deconstruct one or two of these.” What’s being said here? What’s the language? It all depends on what kind of critical analysis people can bring to these stories? And that raises far wider educational issues when it comes to the media. But there are certainly profound issues of media ownership here as you see with the Murdoch Press. I’ve always said that I find it very ironic that an Australian that was willing to become an American in terms of his media empire, is now telling us that we shouldn’t let foreigners tell the British how to run their lives. He and others have a concern that the European Union will take stronger measures around media ownership. The Telegraph as well. That’s currently run by a couple of brothers who live in a tax haven. The whole European Union could take action on tax havens. So there’s certainly a political aspect to this – by which I mean a very self-interested political aspect. Then there is the more small-c conservative British press which is keen to look positive about parliamentary sovereignty and the British being a proud, independent country and nobody tells the British what to do. The idea that we are pooling any sovereignty runs totally counter to British tradition for them. But this is part of an argument it is quite legitimate to have. There are less forgiveable stances: I’m pretty critical of the BBC. I think their coverage is simply not as good as it should be, given the role that the EU plays in legislation and the effect it has on this country and particularly on its foreign policy. They ought to be doing much more serious journalism than they’re doing. Part of it for them is about cost. But part of it is also about political choice. There are still BBC journalists who do not know that members of the European Parliament are elected. Which I think is pretty poor. Really! There are still people who think we’re appointed, which hasn’t happened since direct elections in 1979. They also don’t really understand what co-decision means, and that thanks to this form of negotiation what we do is important. According to them, Westminster is where stuff happens. I think it’s shifting, and I think it’s one of the few positive measures to come out of this European crisis – a growing recognition that the European Union is actually a player here in the UK, and that the European Parliament is part of that. That’s actually quite a good thing. It’s not as if there is a dearth of issues. Look at direct linkage with the crisis, and the issues around financial regulation. To be fair, media have taken up the common fisheries policy: Channel Four and the BBC audience, have been willing to run a story about food, and that has actually really been quite positive in showing how a decision is made in the European Union and how can you actually affect what’s happening. You just start thinking: wouldn’t it be nice to have that really strong public engagement on the Common Agricultural Policy as well, which went backwards instead of forwards. oD: How do you think the media covers you as an MEP and as a member of your party? JL: Well the Greens fight for coverage anyway since Westminster is where it is at. A lot of my work tends to be around asylum, immigration, anti-poverty, even trades union rights, and these are not necessarily everyday stories, certainly not from the European Union perspective. And even when the Daily Mail and the Express have run stories about that work, the last person they will talk to is me. In fact, they don’t talk to me. If it’s the Express their stance is based on the Taxpayers Alliance and UKIP and if it’s the Daily Mail…well, you know. 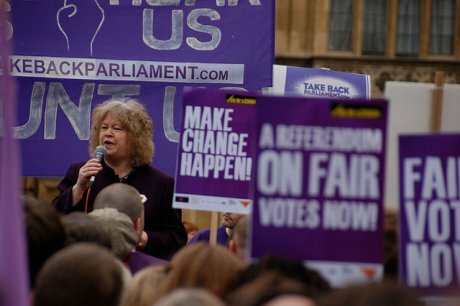 oD: At openDemocracy we’re going to be covering the European elections next year. Do you have any advice on how we should cover it? JL: Firstly I’m happy you’re doing it! Genuinely, because there is so much that is happening out there that people don’t know about which is interesting, which does link to our well-being. It’s also demonstrable that a lot of young people see themselves much more within that European Union context than their parents and grandparents. It’s also really important to be looking at the positive developments that are taking place. It’s about finding solutions, looking at how to do things and what’s going on. There will be an awful lot of people who will want to write about mass unemployment and the rise of the hard right. Those are the stories that will be told. Anything you can find which is coming through as more constructive is going to be really really important. Your coverage has to be not only about protest but also about proposals for the future and solutions to problems. The protest part is the obvious part. Where things start getting really difficult is what do we do about this then. Asking - so “what do you want?” I think that will be really important. oD: So would you agree that these European elections may be both unpredictable and exciting? JL: It depends how you like your excitement. They’re certainly unpredictable. But that makes it important that people vote. If you don’t like what’s happening, one of the bits of power you do have is the ballot. So use it. There will be a huge choice politically. There’ll be a lot of new movements, a lot of opportunities. But vote for the people who will follow through. Too often, voters think – “Right, we’ve told them what we think of them… And now what? ?” What do you expect to happen? What do you want people to be doing the day after the elections? That's what counts. One of the things I do in the European Parliament is to chair our delegation for the countries of South Asia. And when you look there at the recent election in Pakistan, the youth vote really mattered. Youth voters made a difference and what those people are telling me is that the psychological power unleashed in people when they feel, “yeah my vote mattered” has been really important in shifting the democracy up a gear in terms of the relationship between the representatives and the people. You can see it in other countries, places where people are prepared to stand for hours to cast a vote. Then you look at the European Union and people can’t be bothered to walk out of the house and down the road. I think that’s the least you can do, personally. So look at some of the people in that European Parliament now and ask yourself: “Do I want more of them?” I sit there and I’m looking across at Le Pen, at Jobbik, at the BNP from the UK…I don’t want more of those people in that parliament. Use your vote. oD: One final question: What do you hope to get out of this election personally? JL: Personally, being totally selfish, I want to be re-elected. But I also want to see a really strong Green vote in this election. I think we’re fighting a big battle at the moment to actually keep issues of the environment and climate change, including a fundamental international climate justice on the table. So I want to see more people elected who have the same idea about a sustainable future. I want to see an increased voter turnout, particularly amongst the youth. We can be fairly sure that the “sod the lot of you” Euro-voters will turn out. Perhaps that means that other parties will make more of an effort to get the vote out. There are more and more other people who realize the European Union actually really does matter and does have an effect on people’s futures. It’s up to those of us who are interested to try and improve that understanding. The media has a role, but it’s not the only player. There is also politics, and we politicians have a job to do there.